The time span needed to complete an online survey project is on average two-thirds shorter than that of a traditional research method. Because the information is being gathered automatically, you don’t have to wait for paper questionnaires to come back to you. The response rate is almost instant. Online marketing experts say that more than half the responses are in within the first three days of the research project. Using online questionnaires can halve your research costs. Your business can save money on postage, and you don’t have to allocate part of your staff to enter the information into a database. The responses are processed automatically, and the results are accessible at any time. There is a smaller margin of error because participants enter their responses directly into the system. Traditional methods rely on the attentiveness of staff to enter all details correctly, and naturally human error can creep in whenever a person has to perform a repetitive task. 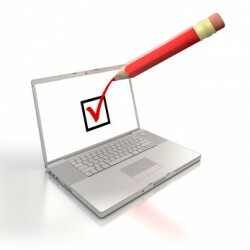 An online survey can be styled to match your business website and your brand. You can choose the colors and layout of your survey, and you can add your company logo. You can also add images, audio, or video to the questions in the survey. Be careful though because sometimes this can lead to long waiting times between questions, when pages are slow to load. This can be potentially off-putting for some participants. To sum up, online surveys are less time consuming, they are cheaper, you get the results faster, and you can transfer and use the data in other business applications. The results of the survey can be used to answer important questions about your business. As a business owner you can design your own online survey with one of the many free online survey tools.